James Hinton joins The Freelance History Writer with an article on Elizabethan history. James is an armchair historian from a long line of navy sailors who turned rogue and joined the army. He currently resides 400 miles from the ocean and is eternally grateful his daughters are not named Elizabeth I and Bloody Mary. The year was 1585. Philip II was king of the most powerful empire of the time. His rule covered not just Spain itself, but portions of the Netherlands, France, the Italian Peninsula, Central Europe, Portugal, and much of the Americas. His wife had been Queen Mary I of England, granting Philip the right to style himself “King of England.” However, the English Parliament had ensured that he was King in name only. Upon Mary’s death Philip lost any influence over the throne to Mary’s half-sister, a demure protestant named Elizabeth I. In spite of the loss of influence over England, Philip had attempted to maintain the best relationship he could, courting Elizabeth and defending her right to the throne against both the Pope and English Catholics. Unfortunately these efforts were to naught, and Elizabeth would prove to be a problem. The crux of the problem was embodied in a man named Francis Drake. A common sailor, in 1573 he had returned to England from a sea voyage which had made him deliriously wealthy. This hadn’t occurred through honest trade however. Drake had made his fortune in the New World, where Philip had forbidden trade involving any ships not flying the Spanish flag. There was only one way an Englishman could get wealthy in the New World. 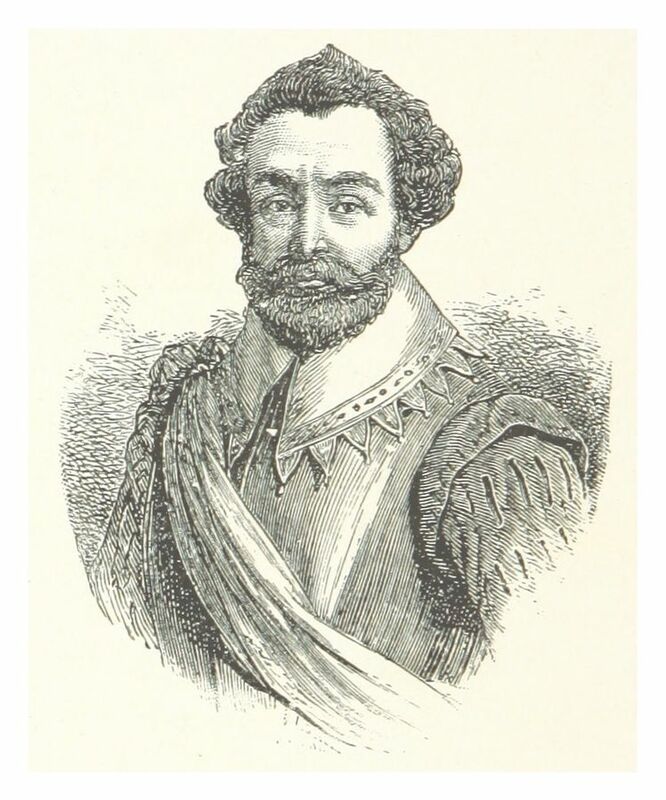 Francis Drake was a pirate. Technically he was a “privateer.” Under the laws of the sea, privateers were officially sanctioned to act as private military leaders under the umbrella of their sponsoring nation. As such they were legally authorized to raid enemy vessels and cities, looting and pillaging as they went. In exchange for crown protection, a portion of their takings belonged to the royal treasury. The problem was England was not at war with Spain. If anything, Spain was doing its best to protect Elizabeth from political foes both inside and outside of England’s shores. Drake’s raids were wholly unjustified. Drake and Elizabeth simply didn’t care. Drake was at sea again by December 1577. This time he embarked on a three year long raid that would see him become only the second person to circumnavigate the world using the same ship the entire journey. The “Golden Hind” returned loaded with such an enormous amount of Spanish loot that Elizabeth’s share surpassed all other crown revenue for that year. Spain had been pricked, and pricked hard. In waters that once had been considered untouchable by pirates, Drake had captured numerous ships, pillaged a large number of towns, and cost Spain a hefty portion of three years’ worth of Spanish treasure. Philip was outraged. He all but demanded Drake’s head. Elizabeth’s response was to endow Drake with a knighthood. The laws of the sea then were considerably different than they are now. Certain principles remained true, however. As Norwich University Professor James Kraska has stated, “governments have responsibilities of oversight over the private military companies that they employ.” Elizabeth had sanctioned Drake, therefore Elizabeth was responsible for Drake’s actions. Philip replied by funneling money into a series of Irish revolts against English rule. Elizabeth would have her hands full dealing with this problem until 1583. Once it was dealt with Elizabeth returned the favor by directing money and men into undermining Spanish rule in the Netherlands. In 1585 Philip faced a decision. Publically he had been fighting to support Elizabeth’s right to rule England. But faced with her clear endorsement of men like Drake and her willingness to channel her portion of Drake’s fortune into Spain’s Dutch enemies, he could no longer maintain this position. Philip chose to turn the might of Spain against England. Elizabeth wasted no time. Just as Drake had been her personal thorn in the side of the Spanish leading up to the war, now Drake would be her sword in their belly. She dispatched Drake to do what Drake did best. His reponse was to go on a rampage. Within days of being given his orders, Drake was in Vigo, Spain. He held the city for two weeks, only leaving after the Spanish paid him off in the very supplies he needed for his mission. Fat with Spanish supplies he struck the Caribbean with twenty-one ships and eighteen hundred men. By the time Drake’s six month long rampage was done the Spanish colonies were devastated. Drake had sacked and burned six cities and destroyed nearly one hundred ships of the Spanish fleet. He would return with a ship wallowing under the burden of loot he’d secured during his raids. It would be decades before the Spain’s Caribbean holdings would fully recover. Gravely embarrassed by this destruction, along with being incensed at the execution of Mary Queen of Scots, Philip called for a final, all-encompassing invasion of England to settle things. He assembled the largest fleet of the time to effect the invasion. Again, Elizabeth’s answer would be Sir Francis Drake and a paltry twenty-four ships, only four of which would be proper warships. As he had done in the East Indies, Drake launched a series of raids on the harbors of Spain, starting in Cadiz (where he destroyed several galleons and captured four more despite being outnumbered at least four to one) and ending in the Azores. At the end of this two month mission he returned to England having used his tiny fleet to sink or capture an additional one hundred enemy ships. Just like the previous raids, his holds were stuffed to the beams with a vast treasure. In the wake of these losses it would be an additional year before the Armada could set sail. When it did, it would meet Drake. The Armada had one hundred and thirty ships manned by eight thousand sailors and was meant to transport an army of fifty-five thousand men. (It would never carry more than fifteen thousand, however). In theory the English fleet was more than capable of handling this, having two hundred ships. However, most of the English ships were ill suited to the task. The Spanish vessels, long designed for defense against English pirates, outgunned the English by fifty percent. To make matters worse, the English could never manage to get all of the ships at sea at any given time. Curiously, Drake was not in command of this troubled fleet. Management of the fleet had been assigned to Lord Howard of Effingham. Charles Howard, however, was very aware of Drake’s capabilities and passed much of the practical control of what was to come to Drake. 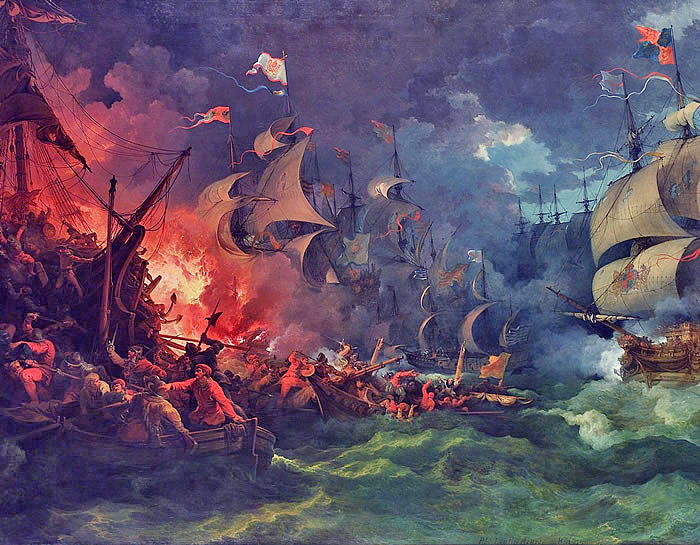 After a brief period of mishaps, Howard and Drake would catch the massive Spanish fleet anchored just off of Calais. Howard and Drake took full advantage of their sleeping foe. In the dark of night they converted several of their already inferior ships into floating bombs full of pitch, sulfur, gunpowder and tar. With sails set to run with the wind these ships barged into the sleeping Armada. Panicked, most of the Spanish fleet cut their cables and scattered. The English were waiting. They poured a heavy and constant fire into the disorganized fleet. After nearly eight hours they were out of ammunition and forced to withdraw. Though the Spanish only lost five ships, most of the remaining vessels had suffered significant damage and losses amongst the crews. This damage was about to prove the undoing of the Spanish. In the wake of the battle, the Spanish felt forced to flee to Spain. Unfortunately for them the (munitionless) English ships were in between them and safety. To avoid another engagement, the decision was made to risk the open ocean with the battered ships of the fleet. The Armada would set course to go around the north of Scotland and Ireland. There they met powerful winds and currents they had not anticipated. Already badly battered and lacking anchors after the incident with the fireships the Spanish ships could not avoid destruction. Only one third of the Armada’s ships and men would make it to Spain, the rest dashed on the rocks of the Irish coast. After this, Drake would continue his career as a seafaring rogue serving the Queen of England for another decade. Though his later exploits would not enjoy nearly the success they had previously, his name alone was enough to strike terror into the Spanish. He would die in 1596 and be buried at sea. 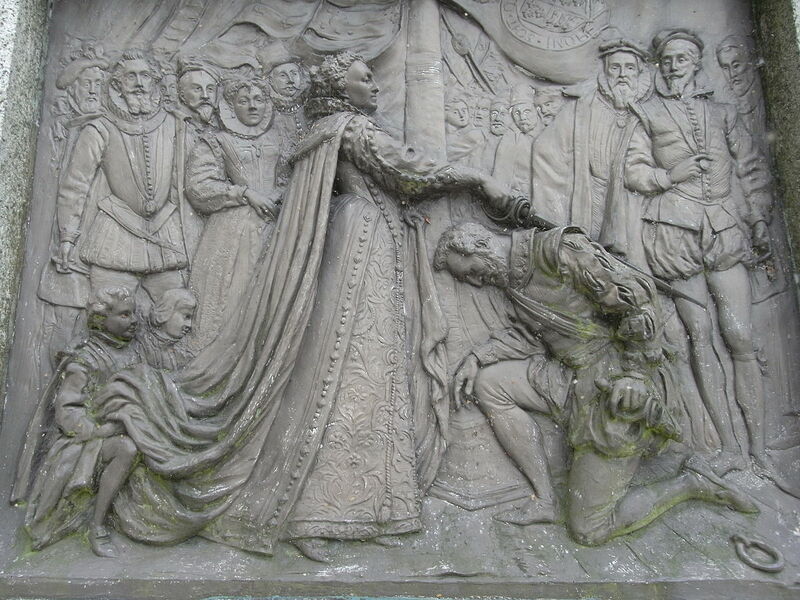 Queen Elizabeth would bask in the favor of the English people for another sixteen years. By the time of her death in 1603, England had gone from a heretic backwater to a wealthy incipient power. Her throne would peacefully pass to Protestant James VI of Scotland, leading to the creation of the United Kingdom in 1707 and establishing the family line that would lead to today’s monarch, Queen Elizabeth II. As for King Philip II, he would only outlive Drake by two years. During the remaining days of his rule he would send two more armadas at England, but neither would be any more successful than the first. Philip would personally see to it that the survivors of the first Armada were properly taken care of for the remainder of their lives and Spain would continue to flourish under his rule. Piracy would outlive all of these figures. Though piracy in the “East Indies” seldom makes news any longer, pirate attacks in the Caribbean go on to this day. Piracy near the Horn of Africa has resulted in an international coalition of navies attempting to combat it (including both English and Spanish ships). And at the box office, piracy is alive and well, and still making a lot of money.